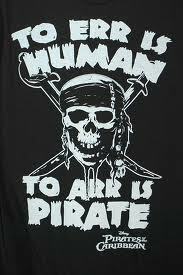 If you’re looking for an excuse to bellow, Avast, ye scurvy scum! without having to suffer through a Comcast service call, this be your lucky day, matey. 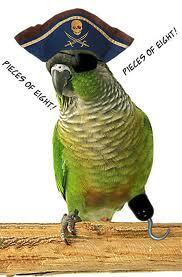 You do know that September 19 is Talk Like a Pirate Day, aye? Silly moiself to even ask – you probably plan your year around this event. You sure it’s talk like a pirate day? For those of you unfamiliar with the holiday, I suggest visiting the TLAP site, for a thrilling historical overview of how two Oregonian buccaneer-wannabees came up with the idea, and how humorist Dave Barry had a hook hand in creating what, I see, now that I have checked the site, is now referred to as International Talk Like a Pirate Day. It used to be just TLAP day. I’m not sure what makes it International, but that is neither here nor there tharrrrrrr. I have enjoyed the spirit behind this whimsical, happenstance-of-a-celebration for many years. I even have a pirate costume that has made more than one embarrass-your-offspring ® appearance over the years. (Hint: show up for the orthodontist appointment festively attired in your pirate gear – your child’s mouthful of pointy objects will quell their objections). 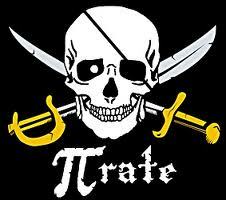 Or celebrate your ultimate geekiness with a shirt that acknowledges both and Pi day and Talk Like a Pirate Day. If you ever happen to catch a glimpse of me when I’m doing my Nordic walking,  and you notice  that my stride suddenly changes – gets a bit more resolute and strutty, even badass, dare I say –you’ve caught me at that wonderful moment when whatever podcast I was listening to ended and I clicked to my music and The White Stripes’ Seven Nation Army began to play. Of course, sometimes the next song in the queue is The Archies‘ one and only hit. Livin’ on the edge, what can I say. Belle telephoned on the 8th, to share some good news. 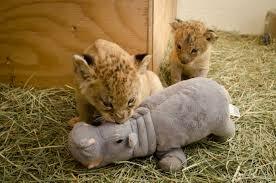 She was quite proud that her Oregon Zoo connections still allowed her to get breaking animal news before the general public, and she knew a “secret” that wasn’t to be announced until the following day: one of the female lions, Kya, had given birth to four cubs. Her call was also to share the news that next weekend she is coming home for a visit…long with seven college/dorm friends that apparently and collectively refer to themselves as The Family. Once I got over my kneejerk, Mafia-Charles Manson associations,  I was delighted to hear about the plans. 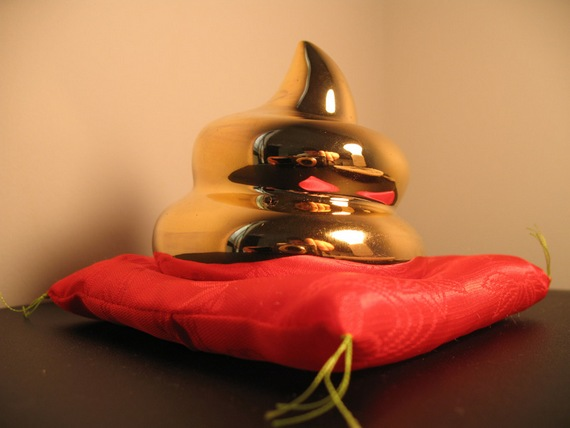 This week’s Golden Turd award goes to…well…me. Thursday morning, while scooping the downstairs litter box, I noticed a deficiency of, shall I say, the usual volume of deposit. This made me fear that one of our cats, a certain one which is prone to do such things, had produced what MH and I – okay; mostly I – call “a runner; ” i.e., she had finished her job somewhere outside the box. I made haste to the family room and began scanning the carpet (the usual runner place of asylum), with a look of determination that made MH to ask me what was up. Unsolicited anthem singing advice: Yo, all of you Star Spangled vocalists who apparently feel the need to show off your chops by essentially ululating every other syllable – knock it off. Or, to take a more charitable tack, I’ll grant that perhaps you’re fiddling with the arrangement as a way to compensate (I’ve heard many a Music Person say that it’s a difficult song to sing) for your inability to stay in tune and on key. Please, I beg of you, just find the right note – one per syllable, it’s there in the sheet music – and hit it, okay? Happy Talk Like A You-Know-What Day! Have fun no matter if/how you celebrate, and if you’ve received any pirate party invitations, be sure to ARRRRRR. S. V. P.
…and the hijinks will ensue. In the account settings, go to language and select English (Pirate). What be a pirate’s favorite vegetable? Arrrrtichokes. What is a pirate’s favorite fast food franchise? Arrrrrrrrrrrby’s. How do pirates know they exist? They think, therefore, they Arrrrrre. And if so, what are you, some kind of Nordic walking stalker? What else did you notice – that I tried to adjust my underwear without breaking step? Keep it to yourself, ok? I’m from a different era; Belle had no idea what I was talking about, when I teased her about the references. Yes, there is also an upstairs litter box. Two, in fact. Upstairs, Downstairs – we’re not talkin’ a Masterpiece Theatre arrangement: we have three indoor cats. I will stand when the announcement Please rise for the singing of our national anthem is made, as the request for standing means everyone is seated, and I take every opportunity to stand up when I’ve been sitting for more than five minutes.